The National Weather Service (NWS), in 2018, recognized SSND-sponsored Mount Mary University in Milwaukee, Wisconsin, for 50 years of service. But the SSND connection actually goes back much farther. Sister Felice Vaudreuil, SSND, chair of the Mathematics Department, was the first to operate the campus weather station, which was started in 1946 after the NWS realized that temperatures collected at the airport and in downtown Milwaukee did not represent the entire city because Lake Michigan has a moderating effect on temperature. Mount Mary was chosen as a third site, and since that time, a School Sister of Notre Dame has been responsible for taking the measurements. 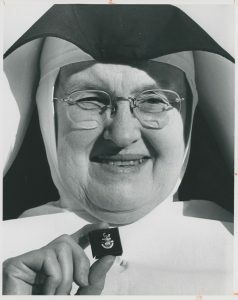 In 1962, Sister Felice received a pin from the state climatologist in recognition of her 15 years of volunteer service. At the time that she received the pin, Sister Felice admitted that she would occasionally send one of the maintenance men out in a blizzard. However, she also recalled shoveling a path through waist-high drifts, taking her readings, re-setting the instruments and plodding back through the new drifts that had quickly formed. The station has been managed by an SSND since 1946. Sister John Ignace Kozniewski took over after Sister Felice retired. She was followed by Sister Loretta Bauer. Sister Georgeann Krzyzanowski, who currently has the responsibility, has been taking the measurements for more than 20 years. In 1968, the NWS set up two weather stations on the campus, one for measuring temperature and the other for rain and snowfall, and the 50-year NWS recognition is based on that date. Sister Georgeann was recently featured in a local news report on the 50th anniversary of the weather station.